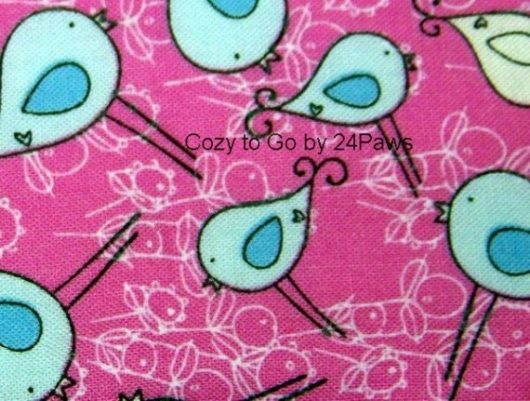 Reusable and handmade coffee sleeve featuring delightful blue and white birds fluttering on a pink background. Gift for the cat and bird lover. 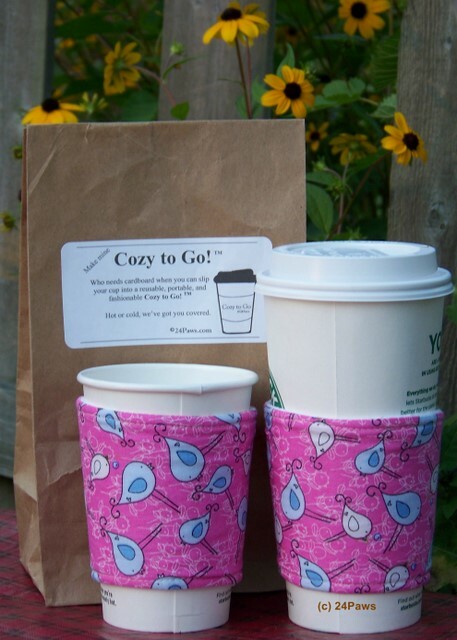 Who needs cardboard when you can slip your cup into a reusable, portable, and fashionable Cozy to Go! coffee sleeve. Hot or cold, we’ve got you covered. This Cozy to Go! wrap will make anyone start whistling a happier tune. Delightful blue and white birds are fluttering about a pink background, with the inside of the wrap in a solid pastel pink. 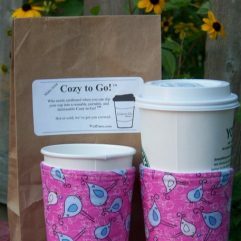 Each Cozy to Go! wrap is cut and sewn by hand. We’ve selected some of the cutest, funniest, and loveliest prints that will keep you smiling every time you reach for our cup wraps. Made of three layers, one outer cotton print, one cotton solid print, and a polyester insulating liner, you’ll be fashionable while protecting your fingers from the cold or hot drink in your hand. Photo shows the Cozy to Go! wrap on a large and small cup. Should fit most to go cups, however, it may not fit all large cups. Listing is for one wrap.